Standard: Quality as per ISO 8573.1 class 3. 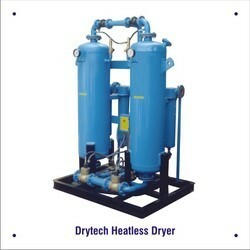 We provide a high quality of Desiccant Air Dryers. We offer Desiccant Air Dryer. 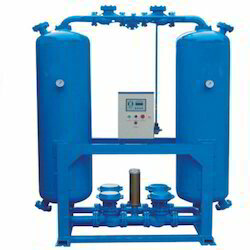 We are leading manufacturer of Desiccant Air Dryer. Desiccant dryers, heatless type, use 10 to 15% purge air for regeneration of desiccant i.e. 10 to 15% of compressor power (HP) is being used as energy operating costs for drying thereby increasing the capital costs in installing extra capacity of compressor. Proven & trouble free valve design Rugged carbon steel construction Less purge loss Low energy heaters Fitted with pre and post air filters Low pressure drop No pressure spikes Large desiccant beds for consistent dew point Conceptualized diffuser design minimizes desiccant attrition losses Quality of Air as per ISO 8573-1 Table 3 Class 2/ Class 1.